Tile continues to grow in popularity as a floor covering, with good reason. Tile has a natural, handcrafted look that's durable and easy to care for. Tile works well in areas with high foot traffic, and it's especially suited to entry areas where water and dirt enter the house. Design patterns are limitless when using all of the possible combinations of size, texture and color. You can further expand your creative toolbox with hand painted tiles and colored grouts. By combining various geometric layout and numerous trim tiles your design options are practically limitless. Finding a tile you like is easy. Just make sure it's the right one for your floor and choose a tile that's rated for the area you where you plan to install it. Entryways need a hard, abrasion-resistant, moisture-proof tile. Baths require a moisture-proof non-slip material. Slip-resistant tile is treated with an abrasive material to "rough up" the smooth surface for safety. Some tiles are rated for indoor or outdoor use only, others can be used in either application. Mosaic tiles are two inches square or smaller and can be installed individually. Mosaic tiles are also available in pre-mounted paper or fabric mesh sheets. All tile feels hard, but some types of tile are actually harder than others. Tile is rated by a series of standardized tests. The tests evaluate a tile's relative hardness (the Moh scale), its ability to stand up to wear and the percentage of water absorbed. Group I - Light Traffic: residential bathroom floors where bare or stocking feet are the norm. Group II - Medium Traffic: home interiors where little abrasion occurs. Don't use in kitchens or entries. Group III - Medium-Heavy Traffic: any home interior. Group IV - Heavy Traffic: homes or light to medium commercial areas. Group V- Extra Heavy Traffic: use it anywhere. These ratings are important, but don't get too bogged down in analysis — they serve to help you find the right tile for your application. Pay closer attention to the ratings test that measures the percentage of water absorbed, or porosity. A tile's porosity is critical especially when choosing tile for kitchens and baths, since these areas need moisture proof flooring. Porous tile should not be used outdoors where cold weather produces freeze/thaw cycles. The classifications for the porosity of tile are: Impervious (least absorbent), Vitreous, Semi-vitreous, and Non-vitreous (most absorbent). The hardness of tile is affected by the firing process. Usually, the longer and hotter the firing, the harder the tile will be. The raw tile material, called bisque, is either single-fired or double-fired. For single-fired tiles, the glaze is applied to the raw material and baked once in a kiln. Double-fired tiles are thicker. Raw material is baked a second time after additional color or decoration is added. On the do-it-yourself project scale, installing tile ranges from easy to challenging. Tiles usually require some cutting to fit. They're applied with mortar or other adhesives, followed by a final application of grout. As with all types of tile, areas that require precision cuts may be more difficult. Flooring presents its own set of concerns. Since tile is not a resilient material, it requires a very stable subsurface. Subfloors frequently have to be built up to the thickness required for tile flooring. See the chart below for some common (and some less common) floor tile. Ralph Waldo Emerson is the author of that beautiful quote. But it was the Jamie Beckwith Collection website that brought it to my attention. Jamie Beckwith is a renowned designer who had the vision to create elegant wood surface treatments for floors and walls. Her unique wood tile designs bring out the best of nature with attention to dimension, profile and embellishment. Enigma is another word for mystery. And this series adds an element of mystery to wood floors by offering intriguing wood tile shapes. Jigsaw, Pisces, sextant, lotus, and crescent to name a few, feed the imagination. Dimension and depth are combined in six block shapes to create high-character wood walls. Walls become works of art, using shadow and light to its best advantage. Mosaic is the art of creating images through the grouping of small pieces. In this case, the pieces are beautifully patterned wood blocks. The resulting image is varied and ever-changing, as wood grain patterns swirl and merge across the floor. Lastly, Jamie Beckwith has brought to life “jewelry” for your walls. Crystals, geodes and gemstones are the crowning jewels adorning each individual wood tile. They can be used alone or combined to accent Projection block walls. 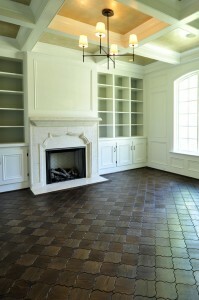 Based in Nashville, Tennessee, the Beckwith Companies are adept at creating exceptional hardwood tiles. Organic materials have been artfully redefined with a fresh, contemporary interpretation. I’m so pleased to be able to share this beautiful collection with you. A list of showrooms across the U.S. that carry this exceptional line can be found at www.jamiebeckwithcollection.com. Explore and enjoy! Great information and well presentation as well! !Thanks for sharing wonderful info regarding flooring tiles..
Lovely, just lovely! It's understated but yet oh, so elegant. Wonderful job.